The TD-12KX might come with a higher price tag than the original, but it's easy to see where your money goes. If you own the earlier version we wouldn't despair - you still have a fabulous kit that acquits itself well against the best in the world. The hands-on experience is such that it doesn't take long to realise this new version is a good step up from the previous product. Cynics may view the refreshing of the TD-12 as a crafty marketing device to eke out another couple of years from an existing product. 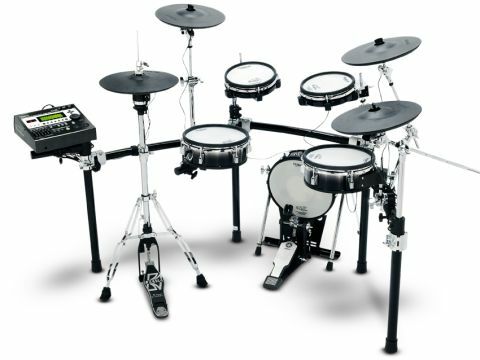 When Roland unveiled the TD-12 electronic drum set a few years ago, it found immediate favour with serious drummers looking for a slice of high performance in a package rather more affordable than the range-topping TD-20. Boasting the same sonic prowess as its bigger brother, the TD-12 has always been an incredibly accomplished performer. And the sacriﬁces it made in terms of editing depth and physical stature were easily balanced by its (relatively affordable) two-and-a-half grand price tag. The original TD-12 gave a good account of itself in the hardware department. The mesh pads, VH-11 hi-hat and tidy rack all added up to a ﬁne semi-pro set-up. But things are even better in 2010. Where the previous version sported 8" pads for toms and kick, the TD-12KX is beefed up with a 10" PD-105 for tom three and the excellent 12" KD-120 kick pad. These are not minor upgrades, particularly in the case of the bass drum - the KD-120 adds signiﬁcantly to the real feel of the set, increasing solidity and rewarding each pedal stroke with a solid response that helps to anchor the heaviest of beats. And the increased size of the third tom means that there is not simply a larger target area, but an appreciably improved playing experience in general. The other hardware upgrade is also very welcome, if not as conspicuous as the addition of larger pads. Look closely and you'll see that the new MDS-12X rack is a sleeker, more reﬁned collection of pipes than came before. Highlights include metal clamps, which are beautifully engineered and vice-like in their grip, banishing any fears of legs and bars drifting apart during a session or gig. Re-designed uprights mean that the tom pads now mount directly into the top of the front legs themselves, and are now positioned with familiar ball-clamp holders. Setting-up was hardly a chore with the previous TD-12, but now it feels even less of an effort. So that's the new physical upgrades dealt with, but it's not the end of the new TD-12 story. As with models elsewhere in the range, Roland has made changes to the internal features of the TD-12 module - in this case bringing it even closer to the (unexpanded) TD-20 ﬂagship. The basic soundset of the TD-12 was always world-class. Acoustic kits sport the kind of organic response that make them thoroughly enjoyable to play - and particularly useful in the studio - while the electronic offering is suitably chunky, biting and ﬁzzy where it should be. It remains a stunning module. But serious users of such devices can always use more editing options, and may need more scope for tailoring sounds and personalising kits for speciﬁc projects. And that's just what Roland has given us with the TD-12KX. It's not earth-shattering stuff, but there are now options to choose between ﬁve different mic positions; three types of strainer adjustment on snare drums; plastic, felt or wood bass drum beater models and either chain or rivet sizzle on the ride cymbal. And while this doesn't represent a re-invention of the TD-12, it sufficiently rounds out its feature set to make these welcome additions indeed. Roland's COSM modelling is impressive, and while it might be easy to dismiss the mic placement feature, for example as a gimmick, in practice it's an impressively useful option. Rather than sounding like a switch between simple EQ curves masquerading as different mic positions, there's a three-dimensional quality to this function that really does alter the character of the drum in question. As such there's a good deal of value added to the kit here, even if it will cost you more than the outgoing set-up.